Anyone who has benefitted from the advancements made in ultrasound testing will agree that this technology is no longer just for leak testing. It is a complimentary companion technology to vibration analysis, infrared imaging, motor-circuit testing and oil analysis. Some will assert that the foundation of any predictive maintenance program should be based on ultrasound first due partly to its versatility, low cost and easy implementation. Nowadays, meeting reliability professionals who still believe in archaic methods for detection of machine faults is rare. That's why it was surprising to read Dan Wise's technical paper, "Knocking Compressor? All you really need is a screwdriver to find the source of the problem." His message compelled me to climb back on my soapbox and scream, "You need ultrasound!" Safety should be taken very seriously. Inspector training is as much about safety as it is about procedure, so it's hard for me to look past the obvious hazards that could come from sticking a greasy screwdriver in your ear and then placing the other end against a knocking compressor valve. It is also difficult to ignore the added risk of working in a noisy compressor room without wearing approved safety gear. Wise's paper suggests that ultrasound is unnecessary because the technology "takes time to learn." Instead, he urges inspectors to develop their skills with a screwdriver "by spending time, each day, paying attention to the sounds of compressors." His advice is conflicting. Are we better to spend time each day learning his "old-school" screwdriver technique, or are we better off to spend our time learning how to use an ultrasound instrument that can do so much more? For more than 20 years, ultrasound has been providing early warning signals for mechanical failure. If you can hear compressor valves knocking with a screwdriver, you are too late. However, there is a fundamental difference in philosophy between what ultrasound inspection proposes to accomplish and what is hoped to be achieved with a screwdriver. Ultrasound monitors the condition of that compressor valve from the time it is new until the time it is ready to be replaced, all the while providing feedback about subtle changes in its operational condition. The screwdriver method is used "to find the source of the problem," which suggests the knocking is already perceivable to the human ear and it is only a matter of days, hours or minutes before the compressor will fail. I call this firefighting. It is certainly not condition-based monitoring, and it leaves no room for planning the repair. The paper warns that "valves can break without warning for a variety of reasons" and goes on to list some common causes for failure. The real reason machine systems fail "without warning" is because no warning system is in place. Using a predictive technology such as ultrasound condition-based monitoring to indicate subtle changes in machines over time allows industry to avoid firefighting catastrophes. A huge benefit of ultrasound is its ability to record dynamic wave files on reciprocating compressors. Using simple time waveform analysis software, it is easy to expand 1/10th or even 1/100th of a second of data to see a valve open, exhaust and close. During that blink of an eye, you can see if there is complete sealing of the valve seat and can even assess the strength of the valve spring. All of this data can be printed in a logical report, which serves as a summary for management to decide if further action is necessary. Because the document becomes a historical archive, the next decision will have a basis of comparison. Reciprocating compressors contain one or more cylinders that compress gases. A simplified example is shown in Figure 1. Pistons travel up and down within the cylinder. On the downstroke, new gas is drawn into the cylinder through an inlet valve. On the upstroke, gas already trapped in the cylinder is compressed and pushed through an outlet valve to a receiver or tank. In this example, a vacuum pulls the outlet valve closed and the inlet valve open, while pressure does the opposite. In more complex reciprocating compressors, more robust valves operate with springs. Opportunities for failure are many. Seal integrity around the piston cylinder wall reduces the efficiency of compression. Dirty and worn valves do not seat properly due to corrosion and buildup around the valve head. Internal leakage around the piston and valve head can be detected with ultrasound inspection by recording a dynamic ultrasound signal and analyzing it over time. Early mechanical failures, which can eventually lead to screwdriver-detectable valve-knocking, can be seen this way, too. In Figure 2, you can see the impact made by the valve when it is seated and the suction of turbulent air flow when the valve is opened. High amplitude signals between the valve impacts can reveal mechanical looseness (early knocking) or internal leakage from piston rings or the valve seat. A comparison of similar valves can be made easily by scaling the Y-axis of the time signal and presenting it in overlay or side-by-side mode. A documented report that cites the historical evolution of your compressor's health can be an extremely valuable and professional way to present your data. It is a great tool for conveying to maintenance managers that a problem is escalating and that action is required. It will hold much more credibility than walking into your boss's office with grease dripping from your ear and suggesting that a compressor valve sounds like a "bongo drum" and should immediately be removed from service. There is no substitution for walking the plant floor and visually taking account of the state of affairs. Much can be learned by talking with operators. 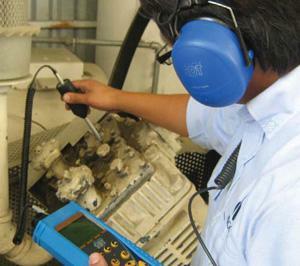 Operators have the best pulse for machine condition because they work around them every day. For those who are ready to take the next step (implementation of a condition-based monitoring program), getting to know the expectations of operations, management and front-line staff is the best approach. From that point, defining the assets that need the most critical monitoring will be as an important of a step as figuring out which technologies should be used to collect the data. Documentation is the final piece of the puzzle. Without it, all other initiatives are pointless. Needless to say, modern techniques for collecting data that can be trended and reported are preferred over archaic methods that rely on individual interpretation and old-school tricks.